This project, at 130-146 York Street, will build 6 affordable owner-occupied live/work units is being lead by the North Limestone Community Development Corporation, with funding from the LFUCG Affordable Housing Trust, ArtPlace America, Peoples Exchange Bank, and The Knight Foundation. vacant or condemned houses. The construction partners are Crawford Builders, ReContained / Emerge Contracting, Nomi Design, and BFMJ. These 6 houses are the first implementation of the Planned Unit Development-2 zoning that North Limestone CDC created and passed into law in 2014/2015. This zoning is a demonstration of how this PUD tool can be used to provide live/work flexibility of use through innovative new use definitions as well as facilitating a return to a way of life that was common before formal single-use zoning was implemented in Lexington in the mid-20th century, when it was not uncommon for someone to work out of their home. J.W. Miller's ledger, found in 128 York and dating to the 1940s, documenting his radio repair business, is evidence of this. And so we see this PUD-2 as a demonstration of how tools in the existing system can be utilized to facilitate financial self-empowerment, entrepreneurialism, and a wide range of small-scale uses that contribute to a finely-grained vibrancy that speaks to place. 136 York is still available for sale - apply now. Affordable Housing is difficult to build. That's why affordable housing often looks the way it does - plywood and concrete is not cheaper for affordable housing, so any project undertaking to create affordable housing has to be creative in how this is accomplished. Often this is done through economy of scale, which results in large multi-unit complexes that all look alike. While this approach certainly has its merits, we felt that, in response to the historically narrow lots and shotgun house typology, a detached home ownership configuration was more appropriate, as it not only allows a wide range of design possibilities, but also gives each unit a door onto the street, promoting both individuality within the collective as well as accountability to the community. Another way to bridge the gap between construction cost and sale / rent price is to utilize volunteer labor, donated materials, donated time, and/or donated land. But there is always some technique. Our approach on this first phase of work on York Street was to buy the land and condemned/vacant houses that stood on that land with grant money from ArtPlace America, take basically no developer fee, provide "free" in-house design and project management services, as well as ask for a grant from LFUCG's Affordable Housing Fund to subsidize the difference between the total per-unit cost of roughly $102,000 and the reality that new shotgun houses in the area were only appraising for $70,000 at the time of our application in March 2015. The raw construction costs were projected at $75,000, so we knew some measure needed to be taken to bridge the gap. Fortunately, the Affordable Housing Fund Board approved a $27,000 grant per unit to make this project possible. 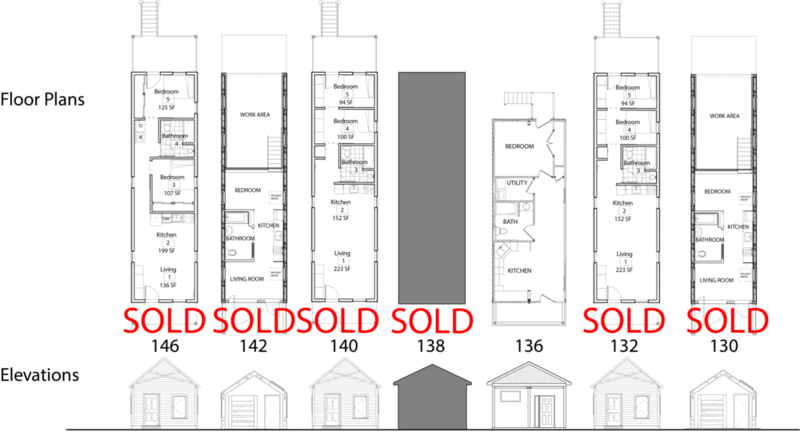 For Phase 1, the house sales will be restricted to buyers making at or below 80% of Area Median Income (80 AMI), a metric that is set by the HUD, the Federal Government's Department of Housing and Urban Development. AMI is set each year for each county in the nation, and so Fayette County's 2015 AMI breakdown is the most current available information. The design goal of the LuigART Makers Spaces project is to create affordable, well-built, energy-efficient, flexible, beautiful, inspiring spaces that respond to and represent the diverse range of people who make this neighborhood vibrant. 136 York is a shipping container home designed and built by ReContained, a subsidiary of Emerge Contracting. 130, 132, 140, 142, and 146 York are being built by Crawford Builders. Of those 5, 130 and 142 York are the result of alt32's York Street Design Competition-winning design. Now Nomi Design, they are acting as a subcontractor to Crawford Builders, providing both the design as well as fabricating elements of the structure, exterior envelope, and interior elements. If you are interested in learning more about one or more of these designs, or would like to buy one, apply here. The LuigART Makers Spaces are located on York and Eddie Streets in the 700 block of North Limestone Street. Situated in the heart of the North Limestone Corridor, the LuigART area is 1 mile from city center, 1 mile from New Circle Road, and 2.5 miles from I-64/I-75.